Satyananda Yoga Centre – Triplicane, is a sincere attempt of Sannyasi Shiva Rishi (AKA) NKT.M.Jeyagopal to provide an authentic experience and exposure to Sadhana, Seva and Samarpan, as given by Swami Sivananda, presented by Swami Satyananda and preserved and propagated by the luminaries of the Bihar Yoga or the Satyananda Yoga tradition. In his childhood & during his young years, NKT.M.Jeyagopal was very playful, weak in studies, with a distracted & dissipated mind; a notorious boy, pain to teachers & elders. During his youth he developed an interest for unhealthy habits. 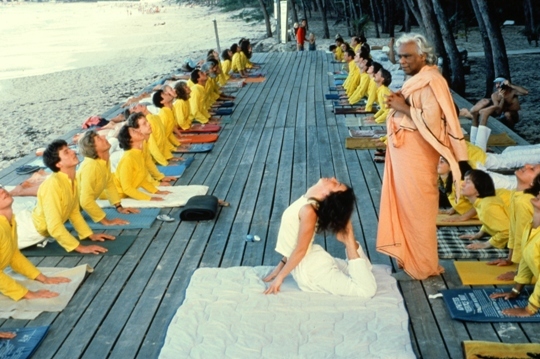 The spoilt youth felt a transformation happening when Yoga touched his life in 1988. Much to his surprise Yoga brought about a universal transformation in him. Today he is known as Sannyasi Shiva Rishi a spiritual name given to him by his Guru Paramahamsa Niranjanananda Saraswati when he was initiated into the Jignasu Sannyasa at Ganga Darshan, Bihar School of Yoga on the first day of Navaratri 2009. He was initiated into Karma Sannyasa on the auspicious day of AKSHAYA TRITIYA in 2012, by Paramahamsa Swami Satyasanganada Saraswati in the sacred grounds of Akhara of Rikhiapeeth. Had the good fortune of getting trained under some of the greatest masters of modern time, into several disciplines of Yoga. Being such a beneficiary of Yoga, he realized that if he had the exposure to the traditions at a younger age it would have been a greater way to experience youth. He decided that he would work to create opportunities for young people to have an enjoyable experience of the ancient wisdom of the Vedic Rishis. To bring this ancient wisdom closer to children and youth, that they feel a connect and a meaning of yogic inputs in their life. SYCT is the culmination of his vision of providing a centre of learning, for those interested in a complete understanding & learning of yoga for spiritual awakening and fulfillment of life purpose to take part in the process of self reflection, refinement, fine tuning of personality; resulting in a readiness for Self Realization. You can read the following pages to know about the journey that he went through.